Point Counter Point - Is it ever proper for juries to ignore or reinterpret the law? With its coffers partially refilling, the State Bar began to revive its attorney discipline system last month with a series of streamlining moves aimed at reducing the burgeoning case backlog as quickly as possible. New priorities giving the bar's chief prosecutor substantial discretion will permit the office to concentrate on the most serious cases and dispose of others more quickly. And emergency amendments to some State Bar Court rules will speed disposition of cases by consolidating multiple matters and encouraging early settlement. All the changes were made with an eye toward fostering public confidence in the discipline operation as well as enhancing the rights of attorneys who are charged with misconduct. Elwood Lui, a former appellate justice who was appointed by the Supreme Court as a special master to oversee the $173-per-lawyer discipline assessment, told the board of governors that the changes are non-controversial and represent a start toward generating a more focused attorney discipline system. "The former practices and policies won't work," Lui said. "Now is the time to undertake the structural change which I think is necessary." Pointing out that the complaint telephone lines, when fully funded, receive 140,000 calls annually, Lui said it is critical to inform complainants quickly whether their case will even be investigated. Under the old system, after all complaints have been investigated, only about 1,000 attorneys were charged with misconduct every year. Lui and the State Bar recommended changes that will increase the rights of both the consumers who bring actionable complaints and the attorneys who are their targets. Both will receive quicker discovery and the possibility of an early evaluation by a neutral judge. Your client has just terminated your services. He wants his documents back, but he owes you $10,000. You wonder if you can hold his files hostage until he pays his bill. If this is your plight, by the middle of this month you will again have a place to turn to resolve your ethical dilemma. 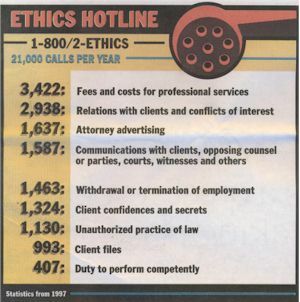 The State Bar will reopen its ethics hotline (1-800/2-ETHICS) using a portion of the $173 discipline assessment the Supreme Court ordered every active Califor-nia lawyer to pay with their 1999 State Bar dues. The State Bar's consumer complaint hotline, shut down for the past 10 months, reopened for business March 1. The toll-free number (1-800/843-9053) will be staffed four hours a day by 13 complaint analysts. "There is no clearer signal that the State Bar is serious about consumer protection than reopening the hotline," said Executive Director Steven A. Nissen. "Californi-ans have been without this important resource for far too long."